How do I get my trumpet vine to flower? I just read now that I can prune my 5 year old vine rather aggressively. Will that promote flowering to take place? I have never pruned it back since planting the vine approx. 5 years ago and now there seems only leaves on the top 1/3 of the vine, the rest (lower 2/3) is only bare vine, no leaves. It has never flowered in the 5 years since I planted it. It is growing up on a chain link fence w/moderate sunshine, but not excessive sunshine. 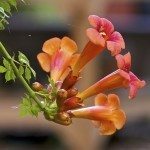 Trumpet Vines are notoriously slow to start blooming, it can take 5 to 8 years. You can add Phosphorous to promote blooming. Bone Meal is a good way to do that.